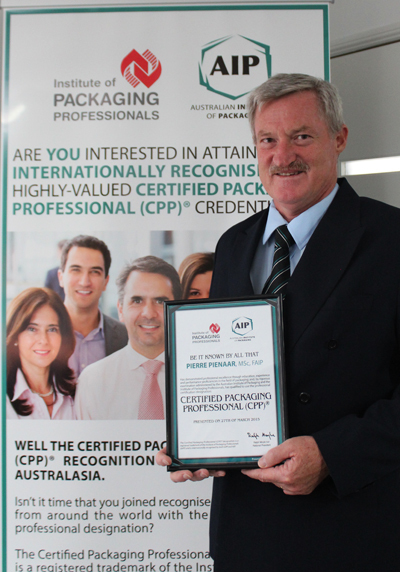 Following the recent launch of the Certified Packaging Professional designation in Australasia the Australian Institute of Packaging (AIP) is pleased to advise that the inaugural recipient of the CPP designation is Pierre Pienaar. “As the inaugural recipient to attain the CPP designation in Australasia I am thrilled to be a part of the newly-formed partnership between the AIP and the IoPP. To date, there are about 2,000 packaging professionals worldwide that have attained the CPP designation and I am really looking forward to seeing other packaging technologists across Australasia join the program,” Mr Pienaar FAIP,CPP said. “I personally believe that attaining the CPP designation is an excellent investment in my professional development and a commitment to excellence in the global packaging profession. I would like to encourage all those that seek to make packaging their profession and who wish to be recognised in a vibrant and ever-changing industry to seek this internationally accepted packaging designation. Being able to have the CPP program now available in Australasia allows packaging professionals the opportunity to join recognised packaging experts from around the world with the industry’s leading professional designation.” he said. Using the CPP program to assess and evaluate one’s professional competency validates you as internationally proficient as a packaging professional, a cut above your peers. The CPP designation will become the leading mark of excellence internationally and a must-have recognition of industry proficiency and achievement for packaging professionals.